When was the last time you Googled your dealership? Has it been a while? How did your reviews look? Think about the last time a potential customer Googled your dealership. Probably today. And their decision on whether to contact you or not is based on your reviews. The majority of consumers are deciding whether or not they trust you to do business with before they’ve even talked to anyone at your dealership. And if your online reputation is poor, you may never get the chance to do business with them. Claim your online listings. If you haven’t done so already, Google your dealership to view and claim online listings for your business. There are also services that will assist you for a fee. Why is this important? So you have control over your online representation. You wouldn’t want a rogue employee or competitor managing your review site. By claiming your online listings, you can ensure each has accurate business information and branding. I recommend adding all of these to a spreadsheet for easy management. Respond to all reviews. This shows consumers that your business is paying attention to what customers are saying and is taking responsibility for righting any wrongs, when possible. Not sure how to respond? Here’s some ideas. Also, if unhappy customers know that you read and respond to reviews, they may decide to be a bit more honest and open to working with you on a resolution rather than just bashing your business. Have false/defamatory/wrong reviews removed. Consumers understand that not all customers are going to be happy with a business, so negative reviews serve the purpose of legitimizing your reviews so it’s not just all positive. Experiences aren’t always perfect and consumers can usually pick out when a reviewer is exaggerating or being unreasonable. However, if the review is completely false, violates the review sites policies or is for a completely different business, have that review removed. Each review site is a little different, but should have a help section detailing how to get these types of reviews removed. Encourage positive reviews. People tend to tell twice the number of people about bad experiences versus good experiences, so if you know a customer had a great experience, ask them to please leave a review. This can also be a good time to promote a referral program. 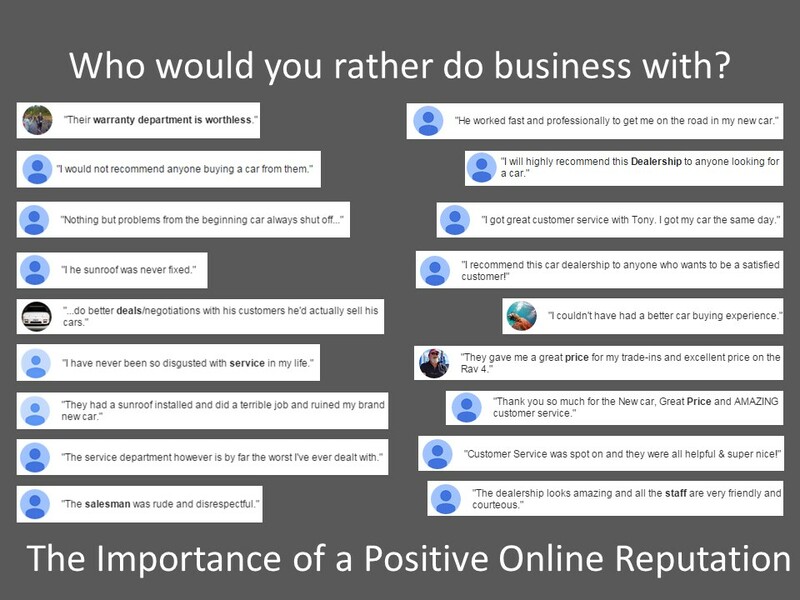 If the customer does leave a positive review, be sure to thank them for it. Field negative reviews. It’s great to get positive reviews, but negative reviews provide the opportunity for improvement. When a customer shares a negative experience with your business, that allows the company to make changes to improve the experiences of other customers. Have a process in place to handle negative feedback, either by sending a feedback form out after every visit to encourage customers to send that feedback directly to your staff (and not on a review site) and be sure to follow-through with trying to improve the customer’s opinion of your business. Ask customers to update their review once resolved. If a customer leaves a negative review about your business online and you resolve the situation to their satisfaction, it’s completely acceptable to ask them to update their review with this information. Updating reviews can be more helpful than deleting because it shows that you took the time to ensure this customer was happy. Set up a Google Alert for your business. A simple way to stay on top of your company’s online reputation is to set up a Google Alert to notify you of online mentions. Be sure to include any variations of your business name and set it up to receive daily or instant notifications. Track results. Don’t just take my word for it, create a baseline of your review site scores and track your score monthly to see progress. Need to improve a score on a particular site? Send happy customers there to leave reviews! These steps may seem like a lot, but once you’ve claimed your listings, spending just a few minutes each week to read and respond to reviews is going to pay off in a major way as your online reputation improves and more online shoppers become your customers. 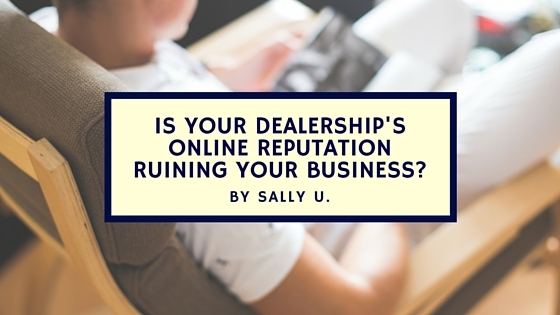 Want some help managing your dealership’s online reputation? Click here to learn more.